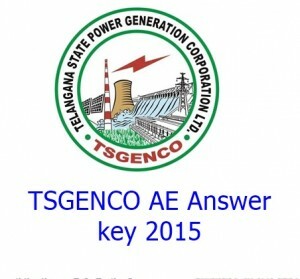 TSGENCO Assistant Engineer(AE) Answer key 14th Nov 2015 Download.Telangana Power Generation corporation limited (AE) results, key For ELEC,MECH, CIVIL, ECE 2015 Download Here. Telangana State Power Generation Corporation Limited (TSGENCO) Had Successfully Completed TS Assistant Engineer(AE) Exam On Nov 14 2015. So Many Students Are Completed Their Written Examination And Tge Aspirants Are Eagerly Waiting For Answer Key.Hence We Provide TSGENCO Assistant Engineer(AE) Answer key With All Branches Here. TSGENCO Is The State Government Organisation By The Telangana Government And This Recruitment Notification Is Must Necessary For Telangana Power Generation Corpopration Limited.The Vaccancies Of This Recruitment is 856 Posts. The Provisional Key Will Be Published One Day After Examination And If Any Objection Or Correction Of Provisional key , They Can Be Raised In The Web Site. Here We Are Providing More Information Will Be Helpful For Those Who Successfully Completd Your Examination And Answer Key Information. Download Your Answer Key And Check It.